Depression in young people is a difficult problem to deal with. Parents often feel at a loss as to how to help and fear greatly what might happen. 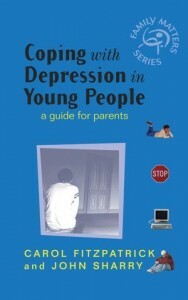 This book by Carol Fitzpatrick and John Sharry is written in response to parents’ requests for reading material to help them understand their young person who is suffering from depression, to show them what they can do to help, and to enable them and all the family survive and come through what can be a very difficult situation. The book deals with the special concerns parents often have, including concerns about self-harm, alcohol and drug overuse and suicide, explaining when and how to get professional help and the treatment approaches used.